Are you one of the many fans of our Melting Sweet Potato recipe? If so, read on, my friend. Today’s Melting Sweet Potato Salad with Candied Maple Pecans and Bacon Vinaigrette and Herbed Goat Cheese is pretty much one of the most delicious winter salads ever to hit my dinner table, and we all know I’m a salad maniac. 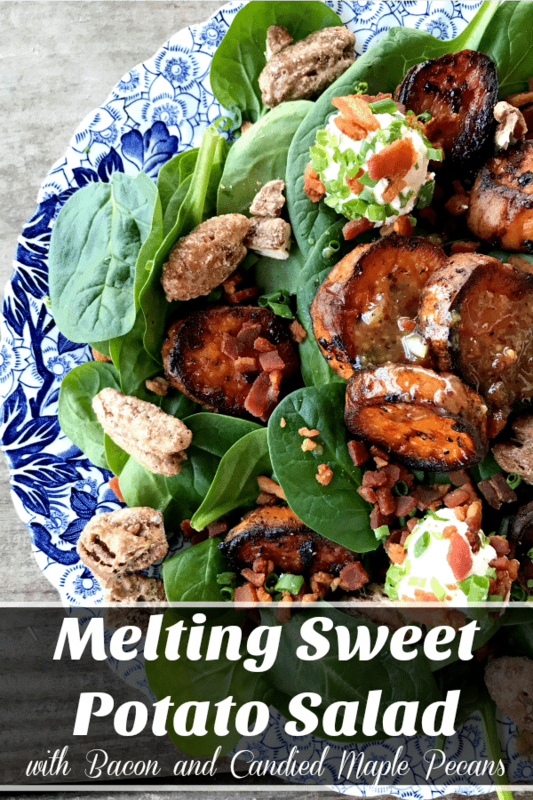 We’re talking about a tender baby spinach salad with gorgeous, caramelized, deep orange melting sweet potato rounds, crumbled bacon, goat cheese crusted with more bacon and fresh chives, candied maple pecans, and an irresistible warm bacon vinaigrette dressing. This is a salad I could happily eat more than once a week. Happily, because so many of the components for Melting Sweet Potato Salad are make-ahead friendly, this is a pretty simple proposition. You can make and store the roasted sweet potatoes for a week, reheating gently in the microwave, oven, or on a hot skillet just before serving. The hot bacon vinaigrette dressing can be made and stored for 5 days in the refrigerator. The candied maple pecans are good for a couple of weeks after being made. When you cook the bacon for your vinaigrette then you can throw the rest of the bacon from that package in the oven. 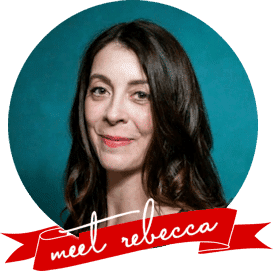 Consequently, you can crumble the bacon, store most of it in an airtight container and then whip up the herbed bacon goat cheese balls and store both in the refrigerator for a week. 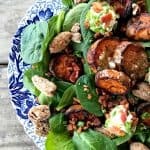 That means all you need to do when this salad strikes your fancy is reheat the dressing and sweet potatoes, throw some fresh baby spinach on a plate, and then dress it all up! For me, Melting Sweet Potato Salad is hearty enough to be a full meal by itself, but as a side salad, it would be a lovely accompaniment to a steak, roast chicken, pork, or beef, or salmon filet. I like the melting sweet potatoes in our melting sweet potato salad to be just warmed through, and this is an ideal use for leftover roasted sweet potatoes. If you’re making them fresh for the purpose, though, be sure to let them cool down to a comfortable-to-handle temperature so they don’t wilt your spinach much. Likewise, the bacon vinaigrette should be warm but not hot. I find a small cookie scoop to be the easiest way to make the goat cheese balls. I just scoop it onto a plate, then roll lightly with my hands before pressing into the plate of chopped chives and bacon. I like the candied maple pecans whole on the salad, but feel free to chop them coarsely if that is your preference. Dress the salad just before serving. The recipe, as written, gives the quantities for a salad large enough to feed 2 hungry people as an entree salad in a romantic dinner for two or 4 as a hearty side salad. You can scale up or down from this, knowing that you’ll want about 2 tablespoons of dressing per 2 cups of packed greens. 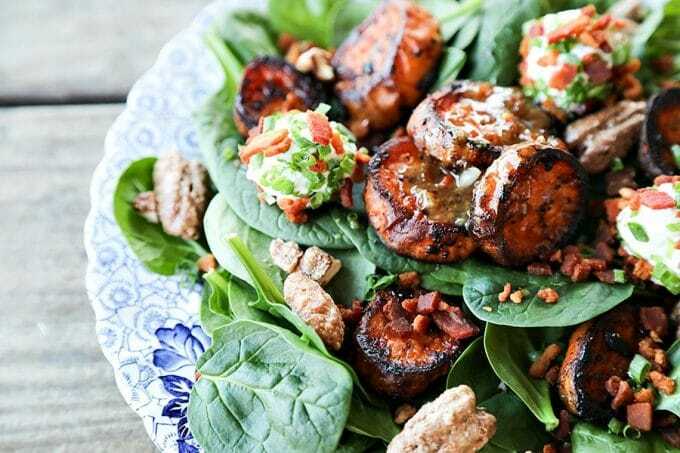 Melting Sweet Potato Salad: tender baby spinach salad with gorgeous, caramelized, deep orange melting sweet potato rounds, crumbled bacon, goat cheese crusted with more bacon and fresh chives, candied maple pecans, and an irresistible hot bacon vinaigrette dressing. Toss the crumbled bacon and chives together on a small plate. Roll the goat cheese balls in the mixture, pressing the chives and bacon into the goat cheese. You will have leftover chives and bacon. Set both the herbed cheese balls and the extra aside. Arrange the baby spinach on a serving platter and top with the melting sweet potatoes. 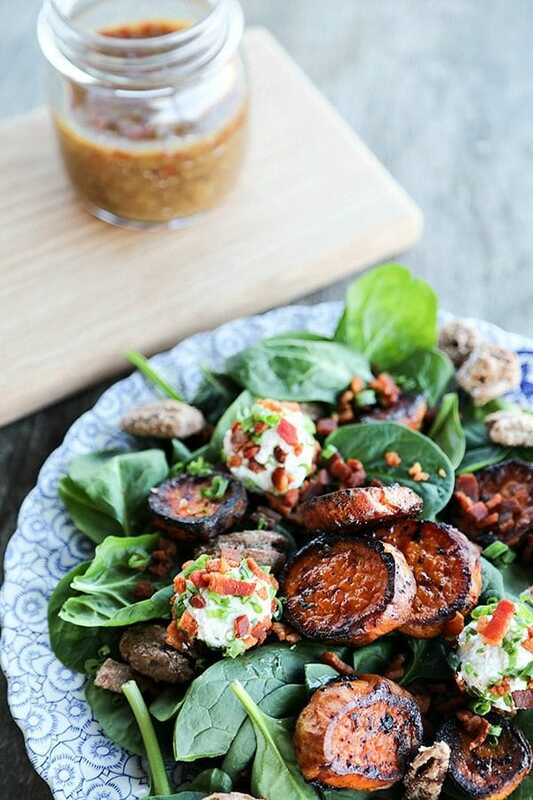 Drizzle the bacon vinaigrette dressing over the sweet potatoes and greens, then top with the herbed goat cheese balls and the candied maple pecans. Scatter any remaining bacon and chives over the salad and serve immediately. Do you love Melting Sweet Potato Salad? 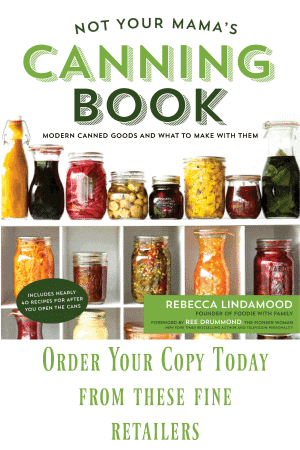 Try these other roasted vegetable dishes! This salad looks like the best lunch!! Love that you can use the leftover potatoes! Thank you so much, Erin! It’s a great use for the leftovers… when you have them. HA! You know I absolutely LOVE your melting sweet potatoes, so I’m ALL over this salad. I’m excited that this can be a salad for two because it will be a great dinner for my husband and me! Amen. At least half of the melting sweet potatoes here get eaten long before the dinner table is set!